Every once in a while an invention crops up with the power to change the world for good. For a long time Marc Parent’s thesis regarding the potential harnessing of the water-creating capabilities of wind turbines proved a non-event, however now with a new model, Eole Water is ready to start constructing the future. The new WMS1000 model has the potential to gather over 1000 liters of water per day, and could revolutionise the way water is provided in Middle Eastern and African jurisdictions. 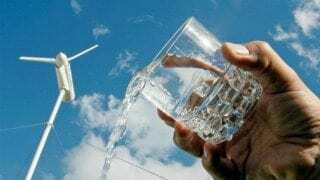 The new invention could have implications for the construction industry, as the easy-to-erect turbine would be perfect for providing hydration on site where it is difficult to supply crew with water by the normal means. The turbines could prove to be the portacabin of the Agua world. After more than 18 months of development and testing in France, the WMS1000, the world’s first wind turbine able to produce 1000 liters of water a day from air condensation, was shipped to Abu Dhabi for its first phase of tests in the extreme weather conditions of Middle East.